Hi! This post is different from my regular notes on rubber machinery. This is a short and quick update about a recently completed refresher training for rubber professionals at Kuala Lumpur (May 5-6, 2015). I had the privilege of delivering this training along with Mehul Patel – renowned rubber compounding and reclaim expert. Mehul (MD of Attuned Polymers Pvt. Ltd) is a veteran rubber industry consultant, ISO TC 45 Project Leader, Chairman of IRI-Mumbai Branch, and has presented over 36 technical papers worldwide. Over 25 professionals from MRB (Malaysian Rubber Board or Lembaga Getah Malaysia (LGM)) and Rubber sector attended this refresher training. Session topics were Reclaim Rubber, Compounding & Mixing, and Adhesives. I covered Machinery. Compounding and Mixing Machinery presentations had key technical and visual inputs from Bainite Machines. The second half of this session aptly titled “Adopting Solutions That Makes A Rubber Mixing Plant…Truly Integrated” had comprehensive inputs from rubber machinery automation solution experts, Base Automation. All the training contents were well received. Some of the sessions had a healthy exchange of ideas, questions and clarifications. The presence of an amazing pool of young talent among the august audience made this program a memorable one for us. The training was well-organized by Ikatan Tekun Sdn Bhd (ITSB) at the lush green campus of MRB Advanced Processing and Product Technology, R&D Centre of Excellence (COE). ITSB, based out of Kuala Lumpur, caters to the requirements of Rubber Industry in Malaysia. Hassan Rahman (Managing Director of Ikatan Tekun) and Fezal Zakaria (Sales & Project Manager of Ikatan Tekun) – the dynamic leaders behind this event – told me “We organized this refresher program to reiterate Ikatan Tekun’s strong commitment to serve the Malaysian Rubber and Tire Industry.” They launched their Technical Consulting Services with this program. And I am informed, ITSB aspires to be the right partner for rubber processing machinery, technical consulting and customized training requirements of the Rubber Industry. So, if you are based out of Malaysia and seeking to buy any rubber machinery or access customized solutions, you may want to first check out the services of ITSB. Their young and dynamic team assures you prompt response and service to your requirements. Buy Smart (Rubber) Machinery Products and Solutions, Malaysia! 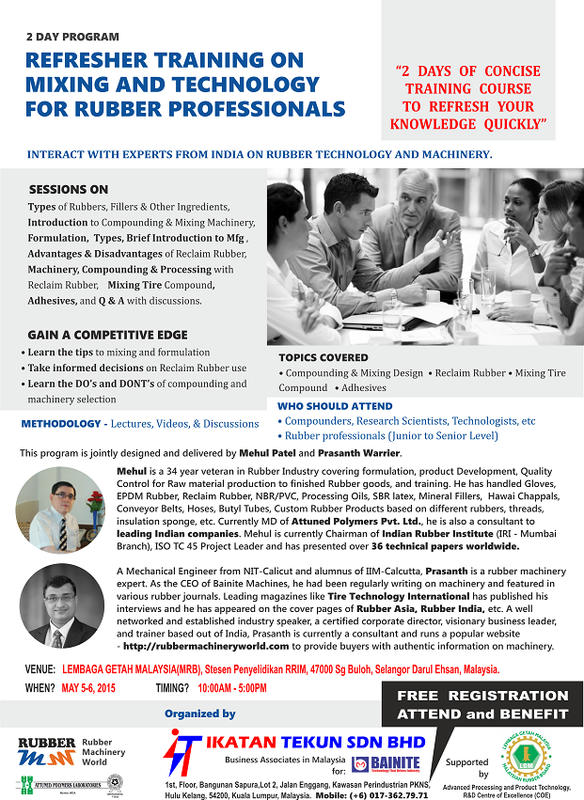 Meanwhile when you plan a training program, please contact me to discuss how I can partner you on rubber machinery topics to offer you a high ROTI (Return On Training Investment). Categories: Skills & Training | Tags: Adhesives, Bainite Machines, Base Automation, Compounding & Mixing, Ikatan Tekun, ITSB, Kuala Lumpur, Lembaga Getah Malaysia, LGM, Malaysia, Malaysian Rubber Board, Mehul Patel, MRB, Reclaim Rubber, Rubber Machinery, training | Permalink. Who supplies such Tandem Mixing Machines in India? we are interested to explore the possible use of these in our manufacturing of Synthetic Rubber Cots & Aprons. HF Mixing Group owns this technology (http://is.gd/pHyQYU). I believe you will have to import them. In India, they have a a JV called Indus UTH HF Mixing Systems Private Ltd in Bangalore and are the official representatives for HF Mixing Group. Please do let me know if you need any further inputs. Many thanks Mr Warrier. appreciate quick response. we know Mr Murthy of UTH in Bnaglore. we will take up with him. in case of need we will come back to you. thanks once again.